Although Eisbären Berlin once again sits atop the DEL standings in the early going of the 2009-10 season, the race for first place is tightly packed, with five clubs currently just six points or less behind the Polar Bears. Second place Adler Mannheim has 26 points, while the Frankfurt Lions (24 points), Augsburg Panthers (24 points), Iserlohn Roosters (23 points) and Grizzly Adams Wolfsburg (23 points) remain within striking distance. Veteran Iserlohn Roosters center Robert Hock is off to the best start of his career. The 36-year-old has racked up 7 goals and 19 assists for a league-best 26 points to date. His assist totals are also tops in the league. Teammates Michael Wolf and Mads Christensen are also off to tremendous offensive starts. Wolf leads the league with 10 goals. His 20 points rank fifth in the league. Christensen is tied for third on the DEL scoring charts with six goals and 21 points. Among defensemen, former NHL player Sascha Goc leads the way offensively. Now in his fifth year with the Hannover Scorpions, the German blueliner has posted 8 goals (4 on the power play) and 16 points in 14 games. Slovak defender Richard Pavlikovsky of the Krefeld Penguins ranks second with 4 goals (3 on the power play) and 14 points. To date, the top-performing goaltenders in the league are longtime league veteran Ian Gordon (Frankfurt Lions) and former NHL netminder Jean-Sabastien Aubin (DEG Metro Stars). The 34-year-old Gordon, a former Calgary Flames farmhand, has posted a 2.23 goals-against average and .932 save percentage in 13 starts to date. Aubin has stopped pucks to the tune of a 2.34 GAA, .929 save percentage and one shutout in 12 starts. Other top netminders include former NHL Fred Brathwaite, Rob Zepp and Jochen Reimer. With four DEL championships in the last five seasons and a colorful 55-year history that includes 19 league titles, defending titlist Eisbären Berlin (Berlin Polar Bears) is the standard-bearer for German hockey. The Polar Bears have also finished first or second during the regular season in six of the last seven campaigns. So it's no surprise to anyone that the club sits in first place in the league with 29 points through the first month of the 2009-10 regular season. The team has played 13 games to date. The DEL has traditionally been one of Europe's most import-reliant leagues, although teams are making greater efforts to develop homegrown talents. The most successful German clubs are still the ones with an NHL-like mentality. They establish a core of veteran players who've played in the NHL and have a competitive mentality and blend in younger, homegrown talent. No one in the DEL does it better than Eisbären Berlin. The team's NHL know-how comes from both its front office and behind the bench. The team's general manager, Peter Lee, played six seasons in the NHL with the Pittsburgh Penguins, for whom he twice scored 30-plus goals. The coach is former NHL defenseman and assistant coach Don Jackson. Lee has focused on strength down the middle, signing former NHL players to anchor the center and defense positions. Jackson, meanwhile, places a heavy emphasis on team defense. The Polar Bears are annually among the toughest teams to score against in the DEL. So far this season, the team has allowed just 39 goals (third best in the league), while scoring 52 (second only to the Iserlohn Roosters). "When we look for defensemen and forwards from overseas we look at three things," Lee said. "First, they need to provide us with offense. Second, they should have the speed to be able to play on the bigger ice surface here. And third, we want character players." The nucleus of the Polar Bears starting defense is comprised of former NHL defensemen, led by shutdown defenseman Richie Regehr (second season with Berlin, third in the DEL) and power-play quarterback Derrick Walser (second stint with team, 2 goals, 10 points, plus-6 rating to date). The top four also includes former St. Louis Blues defenseman Andy Roach (fourth season with Berlin) and ex-AHL defenseman Marvin Degon. Now in his third season with Berlin, former Atlanta Thrashers and Carolina Hurricanes prospect Rob Zepp handles goaltending chores. To date, the 28-year-old Zepp has posted a 2.57 goals-against average while starting 12 of the club's 13 games. His .901 save percentage is a little lower than his norm, but is in part a reflection of the fact that there are often games where he doesn't see a lot of rubber fired his way. Up front, the team has had considerably stability atop its lineup, which is unusual nowadays anywhere in hockey but especially in the transitory German league. Balanced scoring is the key, as the club only has one player in the league's top 15 point-getters and two in the top 20. 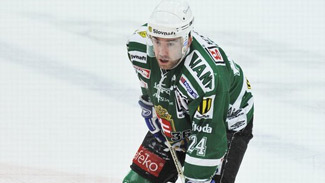 The team's perennial offensive leader, left wing Steve Walker, enters his 10th year with the Eisbären this season after a seven-year, minor-league career in North America. Despite missing a game due to injury, Walker once again tops the team with 9 goals (3 on the power play) and 15 points. The 36-year-old Ontario native, who played in the AHL and the now-defunct IHL prior to signing with Berlin in the summer of 2000, ranks 1 2th on the league scoring table. Eisbären's most prominent new recruit, Jeff Friesen, needs no introduction to NHL fans. The longtime San Jose Sharks, Anaheim Ducks and New Jersey Devils left winger signed a one-year contract with Berlin on Aug. 29. He had been out of pro hockey for a year after failing to earn a contract on a try-out basis with San Jose last season. Through his first 13 DEL games, Friesen has 3 goals and 13 points. While Friesen's signing drew the headlines, the acquisition of unheralded left wing T.J. Mulock has paid equally big dividends. The 24-year-old former Canadian junior A and major junior (Regina Pats and Vancouver Giants) forward had been playing in the German minor leagues with Bad Toelz for the last three seasons. He caught Lee's attention last year after posting 22 goals and 60 points in 44 games. So far, the step up to the DEL hasn't phased Mulock at all. He's tied for 16th in the league with 6 goals and 14 points. Two of Berlin's other mainstay veteran forwards are former NHL players. Denis Pederson is in his seventh campaign with the Eisbären. He has 4 goals and 11 points to date. Native German Stefan Ustorf is in his sixth year with the club. Ustorf, who centers the top power-play unit, leads the team with 10 assists among his 13 points to date. With their dominant performance in the DEL over the last decade and strong ties to North America, the Polar Bears of today have little in common with its forbearers. Originally founded in 1954 as SC Dynamo Berlin, the club was essentially the closest East German hockey equivalent of Russia's CSKA Moscow. The team was endorsed by the athletic clubs of the infamous state police (VP) and secret service (MfS) of the pro-Soviet autocratic socialist government of East Germany. The club won 15 East German championships between 1965-66 and 1988. East German hockey was fairly weak on the whole, and a decided step behind even the program on the other side of the Berlin Wall. After German reunification, the team faced tougher competition in the Bundesliga (the predecessor of the DEL), and found itself relegated to the second league. Upon entering the DEL in 1994-95, Berlin struggled mightily for two seasons before a brief, but dramatic, upswing in the mid-90s. 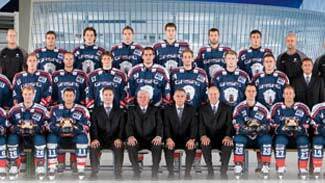 But by 1999, the Eisbären were back in 13th place and it took several years to climb out of the hole. The turning point for the team came in 1999 when the Anschutz Entertainment Group (owned by American entrepreneur Philip Anschutz) purchased the team and Lee became the club's general manager and later, the CEO. Over the course of his tenure Lee has made the club into one of European hockey's model franchises. The opening of a new arena last year has also been a boon to the organization. Last year, Eisbären played host to the Tampa Bay Lightning at the O2 World Arena. The preseason tilt between the clubs marked the first time an NHL club faced a DEL opponent in the German capital.